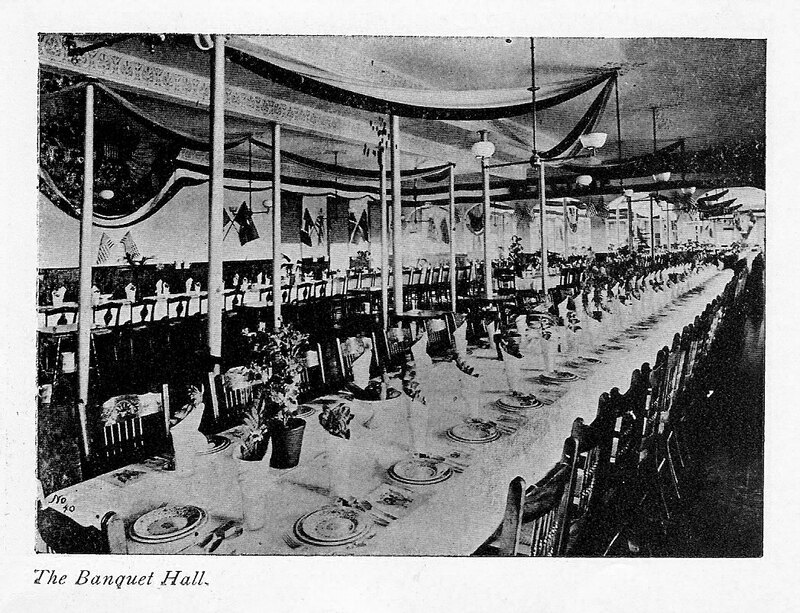 Judging by the five arched windows at the end of the room and other photographic evidence, we are looking at the same room in the photo below of the banquet hall, as in the postcard above of the dining room, just a different arrangement of the tables and chairs. Given the decor – patriotic flags and bunting – in the photo below, we are most certainly looking at a veteran’s reunion banquet about to begin. 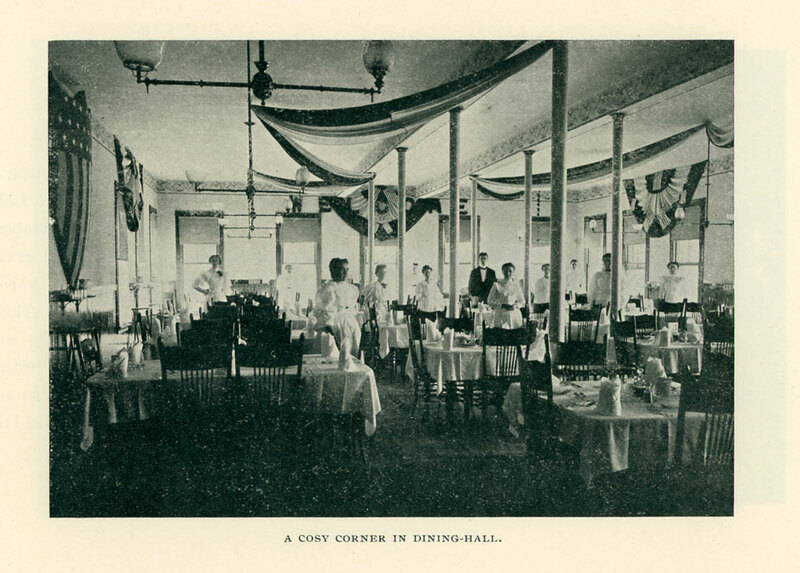 A view of the dining room, appearing in the Hotel brochure and also in the 1899 “Illustrated Laconian”. In this photo, instead of five arched windows, we are looking at five doors at the far end of the room. Possibly this was the other end of the dining room. 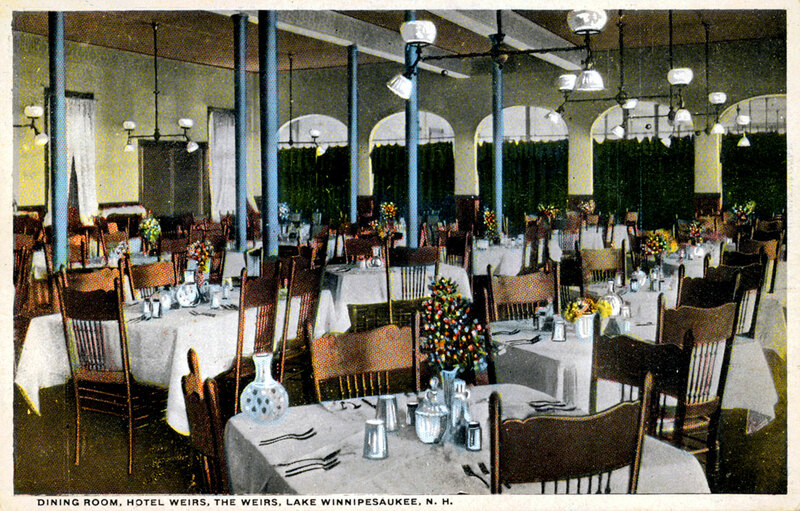 A floor plan of the Hotel would be useful to determine the dining room’s exact location within the Hotel, but it is doubtful that such a plan still exists. 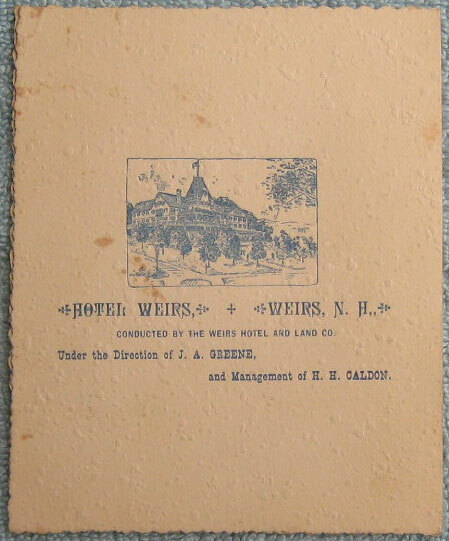 The webmaster recently acquired a Hotel Weirs brochure containing a floor plan of the Hotel. The brochure can be dated to the 1900-1905 period. 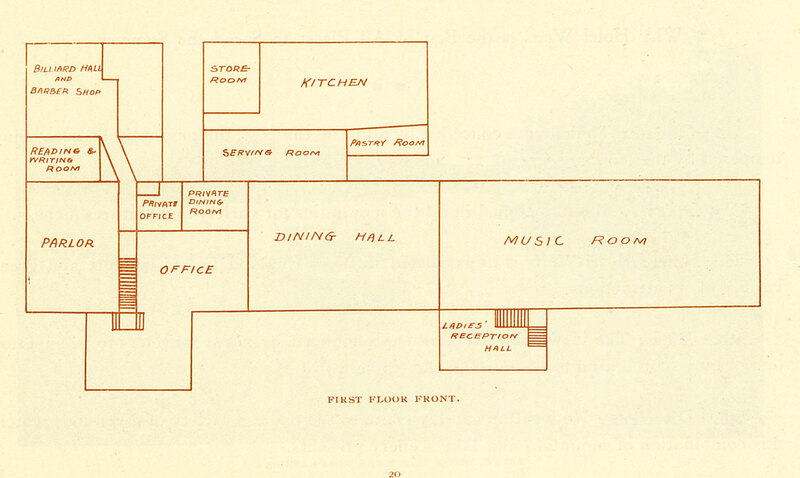 The floor plan below indicates that when required, the dining room was extended into the music room, which more than doubled its capacity. This makes clear that the arches are doorways (not windows) separating the dining room from the music room; while what looks like five doorways at the end of the music room (which was often used for dining) are not doorways at all but windows with their shades drawn. Contrary to the description in the photo, this was the north end of the Hotel, as the Hotel faced East. 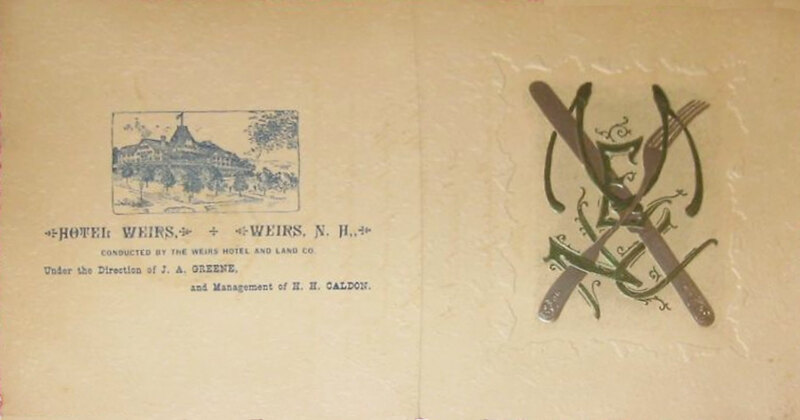 An 1896 menu. There are no prices, as meals were included with a stay at the Hotel. 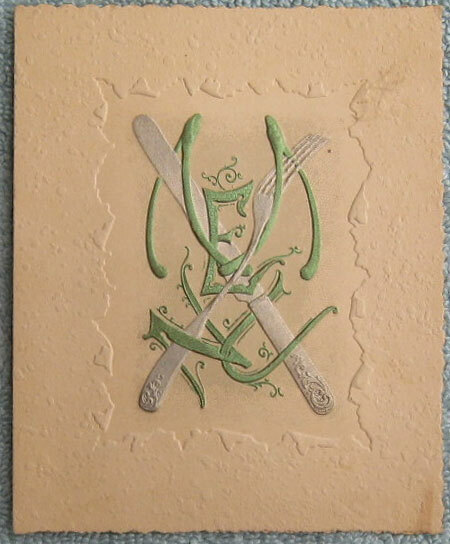 This was a first class menu. Proteins on the menu included Broiled Halibut, Prime Rib, New Hampshire Turkey, Kentucky Mutton, Spring Lamb, Roast Leg of Venison, Ferris Ham, Salmi of Duck, Chicken Salad, and Larded Grouse. For starch there were New Potatos, Mashed Potatos, and Saratoga Chips (potato chips were invented in Saratoga Springs, NY in 1853). One could pick cold vegetables such as Sliced Tomatos, Iced Cucumbers, New Beets, Olives, Gherkins, Radishes, and Mixed Pickles. (Apparently, tossed salads are a more recent invention.) Hot vegetables included Puree of Spinach, Butter Beans, Green Peas, and Asparagus. 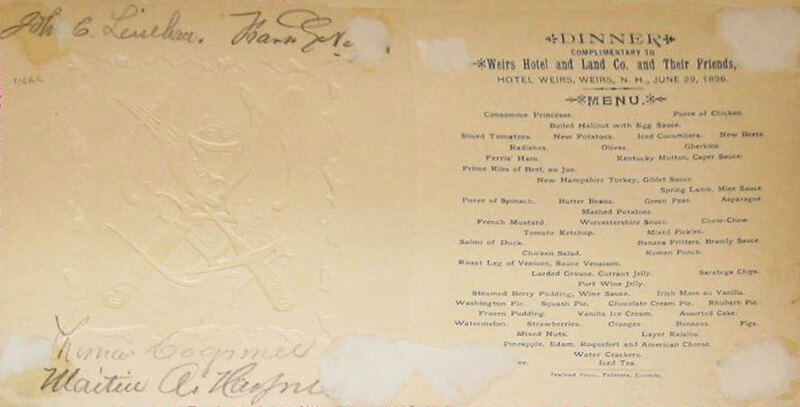 The Hotel also had a great desert menu, including various fruits and cheeses, Steamed Berry Pudding, Irish Moss with Vanilla, and four kinds of pie – Washington, Squash, Rhubarb, and Chocolate Cream. It is interesting to note how condiments such as Tomato Ketchup, French Mustard, and Worcestershire Sauce also made their way onto the menu. 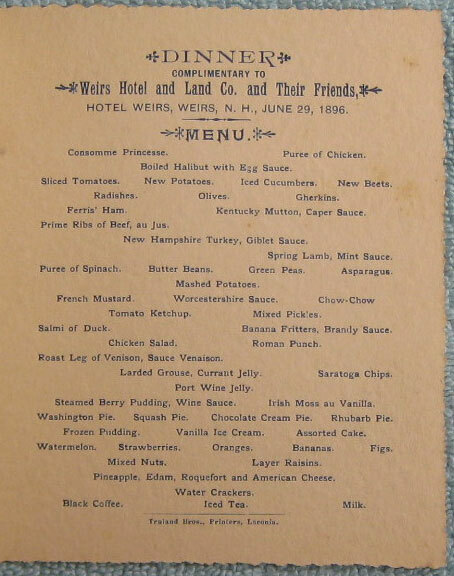 In the upper left corner of the menu is the handwritten name of John C. Linehan, the honoree of the 30th New Hampshire Veterans Association reunion in 1906. A clearer copy of this same menu. Not signed. 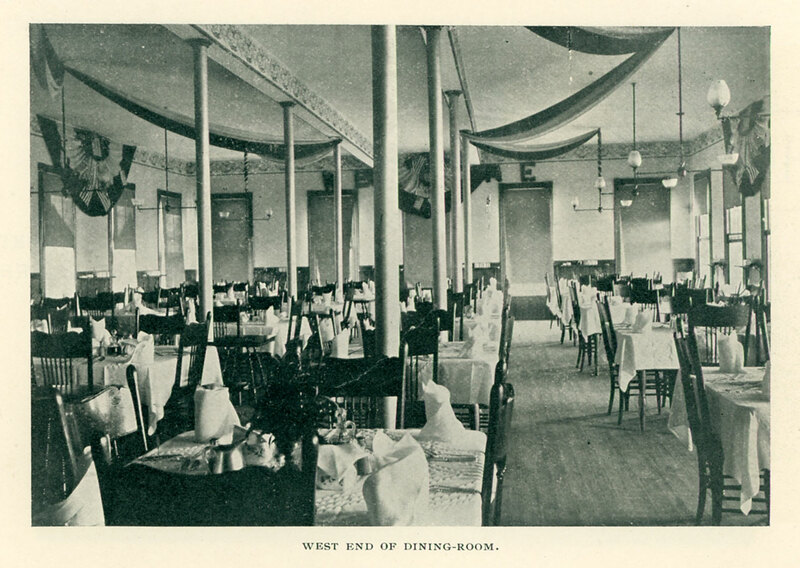 A photo of the “West End” of the dining room and the dining room staff. The five windows are seen with their shades up; while the word Welcome is written over patriotic bunting draped above the windows.